Modern life brings with it a dance of unflagging thoughts and activity. Each of us has periods of having too many irons in the fire, as undoubtedly, we have all experienced. This overloaded plate can have both physical and psychological repercussions. Perhaps stress is always following you. You have been told by your doctor that your blood pressure is higher than it should be. The feeling of never having enough Me Time eats at your thoughts. These are all little reminders to focus on our personal well-being. Taking time to breathe, both metaphorically and literally, is essential for our heath. Studies repeatedly relay the importance of spending time outdoors in a natural setting. Taking the time to step away from our industrious lifestyles and immerse ourselves in the natural wonders around us will offer us many benefits that we may not have expected or thought possible. When we let our minds and bodies relax and be in the moment in a natural setting we allow a reconnection of sorts. The notion of slowing down can be a foreign experience as we tend to feel empowered by taking on much more than necessary for some unknown reason. There is a distinct power in simplicity; in the restructuring of our lifestyle to weed out the unnecessary or perhaps a simple stepping-away from time to time. The combination of taking time for ourselves and being in nature whilst being in the moment with intention can be a liberating experience. The practice of Forest Bathing, or Shinrin-Yoku, supplies a glorious bundle of goodness to the practitioner. The term Shinrin-Yoku was coined by the Japanese Ministry of Agriculture, Forestry and Fisheries in 1982. The meaning is simple; forest bathing or taking in the forest atmosphere. This practice is not about taking a brisk walk while conversing in lively conversation. The focus is on mindfulness, a slow pace and being in the moment. To breathe deeply and notice all that surrounds us. Perhaps the chirping of birds, the rough texture of tree bark, or the fresh green shoots of forest ferns. Immersing oneself in what is happening around them without technological intervention. The Japanese government believed so strongly in Shinrin-Yoku’s benefits that a National Public Health program was implemented in the 1980’s. The belief in the benefits of Shinrin-Yoku led to a $4 million study (from 2004-2012) on the physiological and psychological effects of forest bathing. Forest bathing offers distinct and noticeable benefits at a rapid pace. Individuals will notice a sense of calm wash over them upon letting go of the mental list of what they should be doing. This sense of calm leads to a reduced production of the stress hormone cortisol which is an instant bonus. A lowered heart rate will follow and oftentimes a lowering of blood pressure will take place as an overall sense of well-being evolves. The key is both the combination of the setting (forest) and the motion (slow pace and being in the moment). 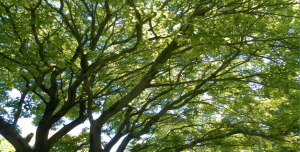 Trees (forest) emit antimicrobial compounds that help to protect themselves from herbivorous pests and to ramp up their defenses against herbivore-damaged neighbours. 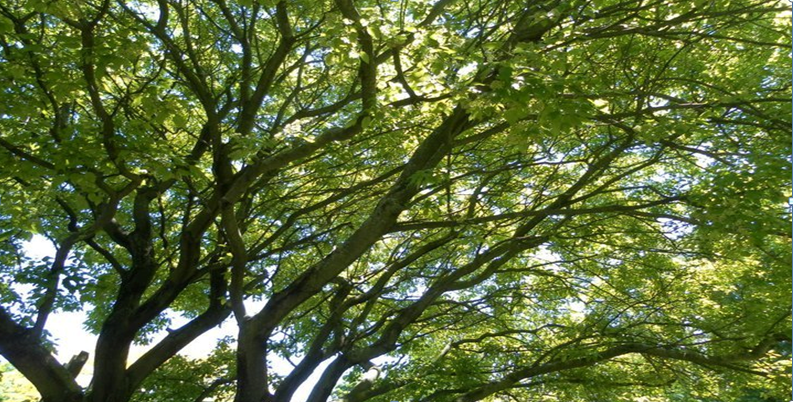 An interesting concept indeed that trees, and plants in general, communicate with each other via emitting organic compounds. The compound known as a-Pinene is found in coniferous forests which exhibits anti-inflammatory and antimicrobial properties, as well as acts as a broad-spectrum antibiotic. It also functions as a bronchodilator as well. There are phytoncides (essential oils) in woods and plants that seem to improve the human immune system upon inhalation. Breathe deeply while taking in the surrounding beauty. An astounding benefit of the practice of Shinrin-Yoku has been studied intensely by Dr. Qing Li, MD, PhD of Hong Kong. Per his research, he states “Phytoncide exposure reduces stress hormones, indirectly increasing the immune systems ability to kill tumor cells.” The activity of NK (Natural Killer) cells was measured in those that were regularly engaging in Shinrin-Yoku. It was noted that the activity in NK cells in the immune system rapidly responded to viral-infected cells and tumor formation; hence, a healthier immune system and cancer prevention. It was found in one study that women who had an average of two to four hours of forest-bathing over a consecutive two-day period saw an almost 40% surge in cancer-fighting white blood cell activity. When measured against urban walks, Shinrin-Yoku lowered cortisol levels almost 16% more than its urban equivalent, lowered pulse rate, blood pressure and led to better nerve activity. There is currently a light being shone on the practice of Shinrin-Yoku as websites are emerging on the practice and groups and clubs are forming to guide interested folks on the delights of forest-bathing. An online starter kit can be found for those that are interested in a little guidance to get started. Perhaps we should all think seriously about getting outdoors and enjoying the benefits. If nothing else, the activity and fresh air will wake us up to the splendour of Nature that we often take for granted. Have you ever contemplated the garden in the winter? We see only a glimpse of what is taking place as we peek out through our windows, safe and comfortable within our warm houses. What we can’t see is the exciting activity that is taking place under the frost layer of the ground. The wondrous processes that are happening underground are not only mysterious but vital to the emergence of a vibrant and healthy garden we can see with the arrival of Spring. Above the soil line, we are witness to our annuals withered or removed prior to the onset of winters’ icy blast. Perennials have been cut back to conserve energy and create a tidy appearance. What we don’t see is that the once lovely annuals that gave a sensational punch of colour to our summer gardens may have left behind seeds to replace the original plant. Also void from our vision is that the once lush and lovely perennials are working diligently under the soil to bring forth an abundance of beauty when the warmth returns. 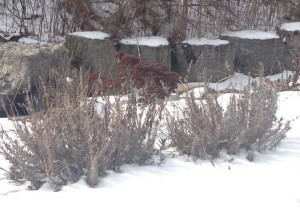 Perennials over-winter by slowing their growth and protecting themselves by alter-ing their roots functions. At the onset of winter the roots release a large portion of the water contained in their cells out into the surrounding soil. This reduces the risk of internal expansion of the water within the cells that in turn would damage the root cells. The remaining water that remains in the roots con-tains high concentrations of sugars and salt which lowers the freezing point, acting as a natural anti-freeze. What this means above the soil is that when roots are damaged or weak, plant growth is stunted or non-existent leading to the plants death. The government of Canada has recently conducted an interesting study in regard to soil under Cana-dian winter weather conditions. The findings are quite interesting to say the least. The study has con-cluded that up to 70% of gases due to natural decomposition of plant material, microorganisms, manure and fertilizers occurs during the winter months dependent upon the amount of snowfall. Winter soil ac-tivity affects spring growth due to the levels of carbon and phosphorus that is available for plant growth. As a Horticulture Technician, I automatically think of the well-being of our biggest allies in the garden when winter is upon us. My thoughts turn to the interconnectedness of the soil web in relation to worms and microorganisms. These are the (mostly) unseen forces that can make or break the health of a gar-den. Worms work tirelessly to create porous and nutrient rich soil by tunneling which in turn creates air space as well as loosens soil for plant roots to grow freely in search of water and nutrients. Worms also emit a slime that to us may seem grotesque but to the garden it is lush with nitrogen and helps to bind soil particles for good soil texture. Interestingly, our earthworm friends may overwinter in varying ways. While some earthworms burrow as deep as six feet underground and hibernate, others manufacture glycerol to allow their systems to overwinter, while other worms act selflessly for the good of the garden and fill cocoons with eggs after which the worm locates fallen leaves to burrow under while it prepares itself for death. These eggs will in turn hatch when Spring signals its long-awaited arrival. Often over-looked are the various animals that can be found hibernating underground such as gophers, frogs, insects, and snakes to name just a few. A few species of frogs have adapted to the cold months and developed the ability to manufacture their own version of antifreeze, allowing them to freeze for long periods of time without suffering serious cell damage. With the arrival of cold winter winds, it’s easy to overlook the activity in the garden not visible to the naked eye. When we protect our gardens with a thick layer of mulch and promote healthy soil through-out the year we supply optimal conditions for the gardens unsung heroes to remain strong and able to pounce into action with the arrival of Spring.